Blog What Medical Training Should I Get For Concealed Carry? This article is meant to show you what training you should get for concealed carry. What is included in the article are references, links for additional training and resources and lastly definitions and descriptions. Always remember, make sure you and your family are safe before attempting to offer assistance to anyone. Never do so if it means sacrificing your own safety. To answer what medical training you should get, you have to know why medical training is essential. It is important to note that I am not a medical professional, I simply have enough experience and training to stop some major bleeds, assess the bleed, perform CPR, assess- insert and use any one of the top three utilized tourniquets, use a Halo Chest Seal, nasopharyngeal airway and even suture or staple depending on need. I firmly recommend getting any training you can, when it comes to caring for your self and family, make sure you find the best that you can afford. In 2015 27.6 million people were treated in an emergency department for injuries. Over 2.8 million were hospitalized due to injuries and 214,000 people died from injuries in the United States. (Injury prevention and control, 2017) These numbers are fact, they are compiled from raw data and regardless your feelings on the CDC they keep very detailed records. Now, firearms are used between 200,000 and 3 million times every year in self defense, with most legitimate studies showing that a firearm is used closer to 3 million times. (Leshner, 2013) The book referenced costs $38 and is worth reading if you have the chance. Here is an excerpt, “studies…have found consistently lower injury rates among gun-using crime victims compared with victims who used other self-protective strategies.” Another quote is as follows, “ The estimate of 3 million defensive uses per year is based on an extrapolation from a small number of responses taken from more than 19 national surveys. Now that we understand why medical training is so essential to concealed carry, what medical training do we need to have? There is a phrase that has been popularized over the past few years, “stop the bleed.” What this phrase means is quite simple, train to stop bleeding. Medically there are other important items to consider, airway blockages, CPR and a few other important medical considerations. For a concealed carrier, the plan should always be centered around what they may encounter most. In this case another individual with a knife, firearm or other deadly weapon. The damage that will occur from a wide variety of deadly weapons carried today regardless location can range from penetrating or slash wounds causing rapid exsanguination (blood loss) and crushing injuries causing broken limbs coupled with exsanguination of the rapid or slow type both of which can result in death. Lastly, shock and or extreme trauma induced heart attacks and stress related breathing issues can also result. Interestingly the government has released a few little known publications in the public sphere regarding trauma care and the need for immediate action. For instance per the Department of Homeland Security, FEMA, these are the five “simple” steps that may save a life. Call 9-1-1, Stay Safe, Stop the Bleeding, Position the Injured, Provide Comfort. (FEMA, 2014) Follow the links and take the on-line training, while it is not the same as hands on training, this will help you better understand what is needed. Additional bleeding control training is made available by the American College of Surgeons through the website, bleedingcontrol.org, lastly FirstCareProvider offers instructor courses and has been endorsed by a few organizations that offer it legitimacy. Care is a term coined and used by DHS and FEMA that stands for the following. Control bleeding with direct pressure or tourniquet. Airway improvement with recovery position. Respirations improve by covering open chest wounds. Exposure to the elements causes loss of heat. This can help understand the added training needs everyone who carries concealed should have as a precaution. Find a course that offers you training in CARE as well as carry specific trauma care. Call 9-1-1 first, do not panic, panic prevents care from occurring. Control bleeding, find the source of bleeding. Open or remove the clothing over the wounded area so that you can see the wound. Head wounds will always bleed profusely, they will always seem very bad. Pressure should be used on head and trunk (body, not arm or leg) injuries. Using a clean cloth if possible, fold it and press firmly on the wound, hold a firm pressure and maintain that pressure until the paramedics arrive. Stopping the bleed is far more important at this stage than preventing infection. Both should be attempted when possible, which is why I suggest wound cleaners and sterile gauze, homeostatic bandages and Israeli style bandages. However, this is not always the case, so stop the bleed first! If the wound is on the groin, trunk or close to the body and is deep and bleeding steadily, pack the wound using a clean cloth and if you have a trauma kit use your Israeli style bandage or a homeostatic bandage. I keep two of each in my vehicle based trauma kits. 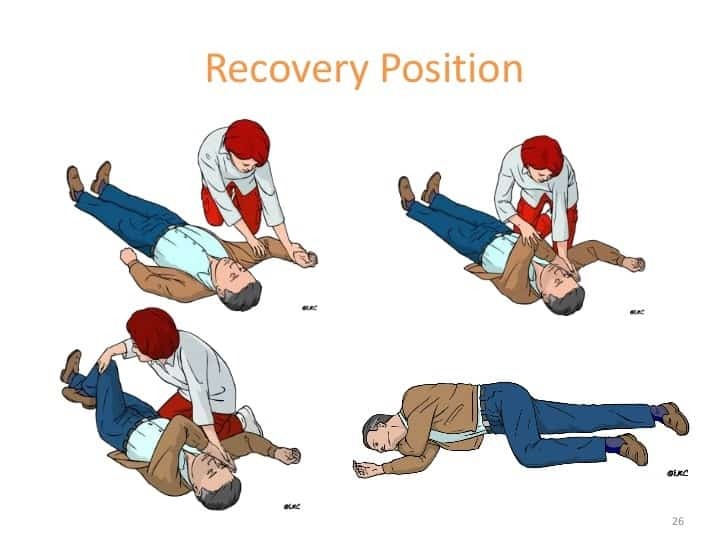 Next is Airway improvement with recovery position. This is extremely important of the person is having difficulty breathing or has lost consciousness. Establish that the airway is not obstructed, the tongue is the most common obstruction. If you see a foreign object and it can be removed easily, remove it. Tilt the head back and lift the chin, this will straighten out the airway and make it easier for breathing to occur. Using your CPR mask if you have one, place it over the victims mouth and nose, ensuring the head is tilted as can be seen in the attached picture, blow air into the mouth, two one second breaths forcing the chest to rise and fall with each. If the breaths do not cause the chest to rise and fall, engage in chest compressions. These are given differently for adults and children so make sure you take a course that teaches this! Chest compressions should be administered at a 30:2 ratio, meaning 30 chest compressions with two solid breaths in between. Continue compressions until EMS arrives or the person begins to breath on their own. If they begin to breath on their own roll them into the recovery position, pictured here. Respirations improve by covering open chest wounds. This part of care is more tricky and requires chest seals or again clean clothes applied directly to the wound area. Finding training in CARE will help you better understand what to do in this regards. Not all wounds are the same, and all should be assessed and treated per the guidelines given in prior linked articles and through application of learned materials from classes linked. Lastly is Exposure to the elements causes loss of heat. This has a more simple solution, use a blanket or space blanket which should be carried in your trauma kit or vehicle. I keep two 90% or greater wool blankets inside of 9’ square tarps in my vehicles along with 2-4 small mylar space blankets in each trauma kit and in the vehicle. Preventing exposure can increase the possibility of a beneficial outcome with someone who has been in a vehicle accident or other form of traumatic incident. If the person is unconscious, check for obstructions in the airway, check for bleeding and than place them in the recovery position inside of the blanket or space blanket. For concealed carry the medical training you should get is the same as the medical training you should have for driving a vehicle, camping, hiking, bicycling and swimming activities. It is worth the time invested to ensure your training stays up to date as well. New approaches are innovated quite often in the medical community and this means training does not end with your medical license 30 years ago or a course you took in the 80s for CPR. What is known and taught now is far different than what was taught in the 80s, 90s, and even in the early 2000s. Stay abreast the new knowledge and utilize common sense.